A Free Kitchenaid Stand Mixer! Yeap, you heard it right! And if you bake, you’ll know that I’m the luckiest person on Earth to have my hands on this baby for nothing at all. Many thanks to my co-worker Steph who dug this out of her garage in the middle of the winter just for me. Apparently her father-in-law had acquired the mixer at a estate sale for only $3!! This piece of machine is at least a few hundred bucks and built like a tank! And it came with the wire whisk, dough hook and beaters, all in perfect condition. I was told that not only that this is a nicely made solid piece of machinery that is probably a few decades old, but this specific model is one of the higher end ones in the market for household use. This is a bowl-lift model, versus the tilt-head model. It was a little dusty, but nothing a little elbow grease and baking soda couldn’t handle and VOILA! It’s shining like new again. This entry was posted in Cakes n' Bakes, News and Views, Stuff and tagged cake, food, icing, Kitchenaid, stand mixer, Wilton. Bookmark the permalink. Great luck getting the free mixer. If you get a chance you should pick up the pasta attachments. In about 5 minutes you can go from a bag of pasta flour to the freshest softest and delicate tasting pasta. It truly is an amazing machine too. Hee hee… Thanks, kitchenaidmixer and Pina. I will pick up the pasta attachment when I find one on eBay for cheap, and I also saw an ice-cream maker attachment that will be great got the summer! Pina, you can find one of these retro baby on eBay (US) for less than $100.. really. Check it out! You got a FREE KITCHEN AID MIXER! I am super jealous now! Awesome, and your graduation cake was lovely! LOL! Thanks, Lisa and Ling. I will refer to this baby with capitalization the next time I speak about it! Wow, I’ve never heard a group of people talk so lovingly about their stand mixers…I thought I was the only one. 🙂 Great find, great deal, and good luck with all of the KITCHENAID possibilities! 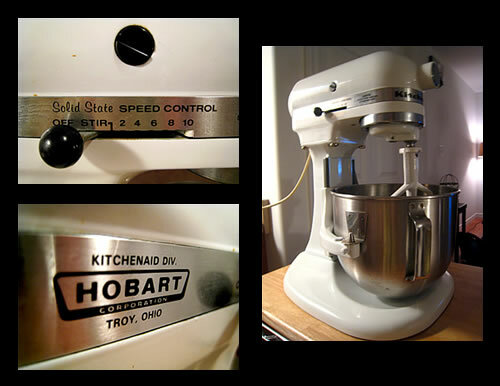 As years go by, so does the quality of KitchenAid mixers. Now the Kitchen Aid “home” models have plastic gears, break easily and customer service is unfriendly. Hamilton Beach gets better ratings, and there are a few other lesser known bronds that are found in Europe making their way into the US. Buyer beware and be careful never to overtax your mixer with more than what it can handle. My 20 year old Sunbeam was a delight but it never could mix bread or a large batch of cookie dough well. Finding a replacement at a reasonable price has ben agony. Kitchenaid small appliances are the best. I have a food processor by them. It’s a rock. Question:” Should I close my checking and savings account with my bank since I’m enrolling a credit card Debt Consolidation plan along with a set of different debts. When you apply for a government grant.